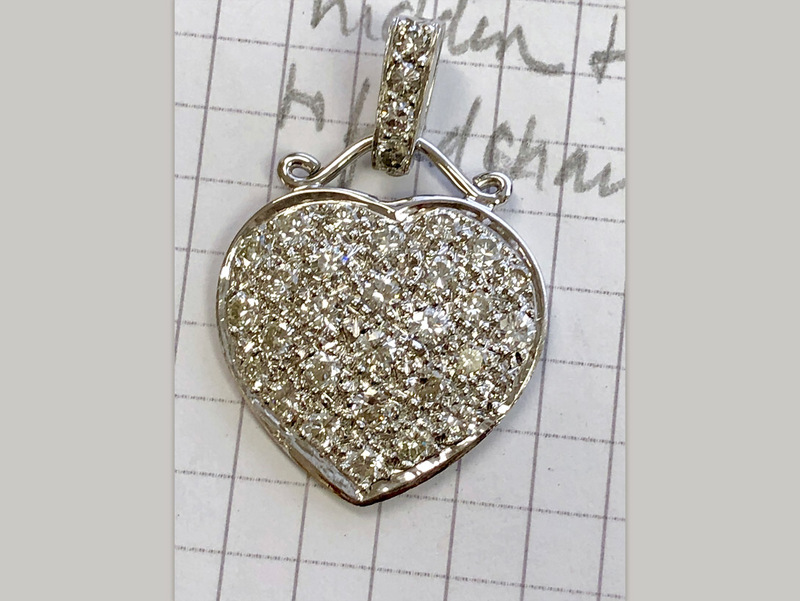 she lost a heart pendant that had been a gift from her husband, and her mother gave her one earring out of the pair of heart-shaped diamond earrings she had purchased from an auction house in Boston. we met many years ago when i had the privilege to help her with an insurance claim and with her heart-shaped diamond engagement ring. she rediscovered me on Facebook and began to follow my posts. 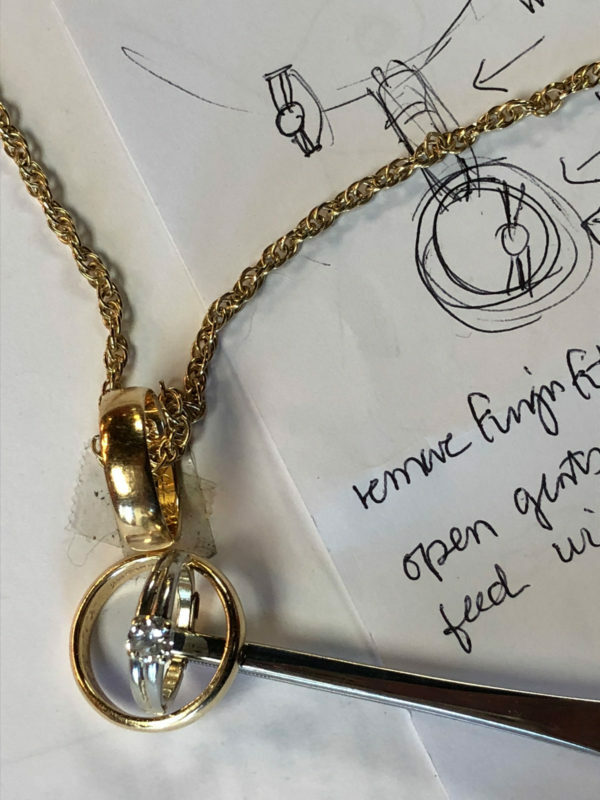 she contacted me via Messenger, and one thing led to another – namely, to a shop visit and the beginning of a brainstorm. 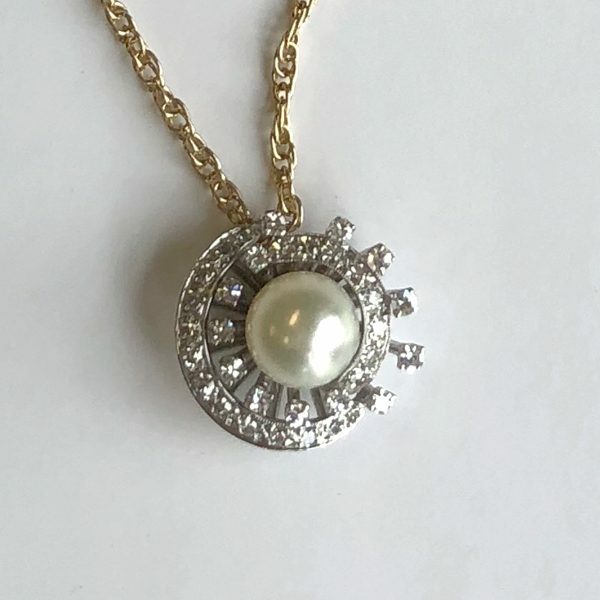 she knew that she wanted me to convert the gifted earring into a pendant to replace the one she lost. 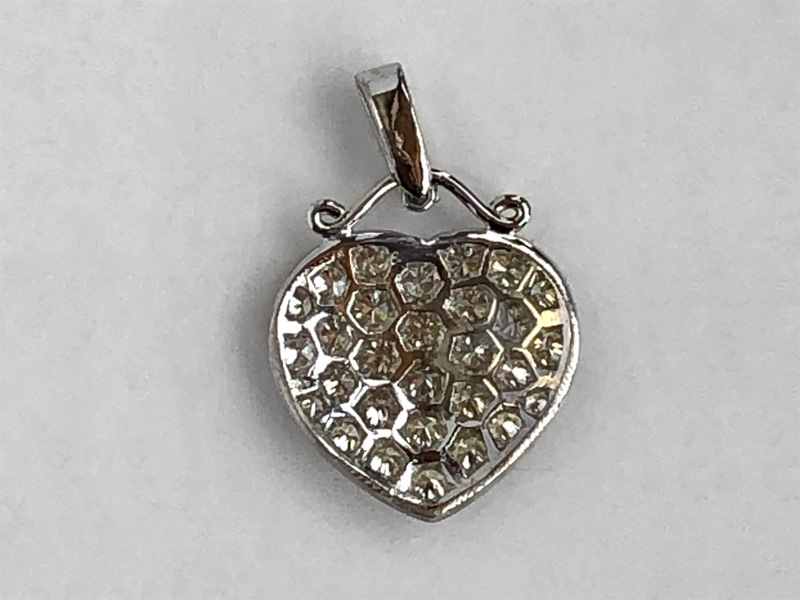 she is quite honest about her love of all things diamond – especially heart shapes – but she did not like the dated frame around the heart set in the earring. rightly so, as this was a design popular in the 1980’s and 1990’s. the first thing that was required was removal of the earring hardware. she nixed the idea of leaving the yellow gold “door knocker” frame. 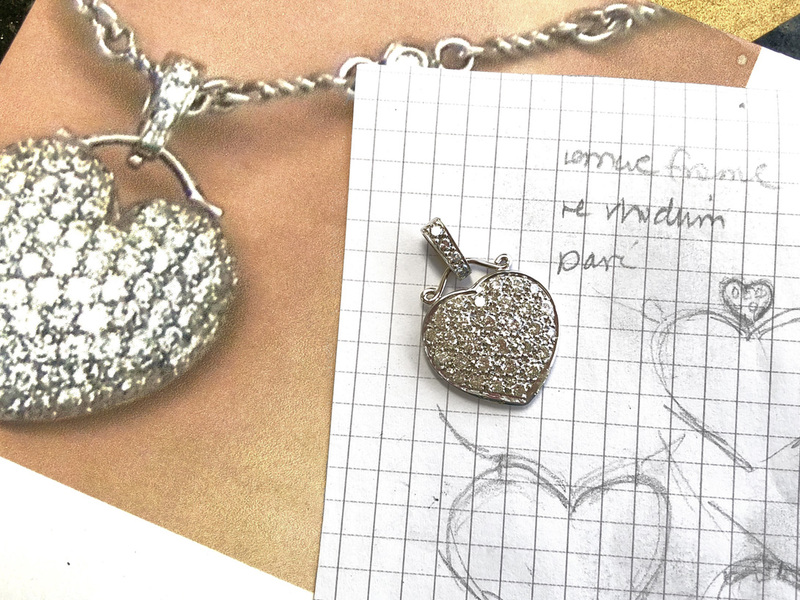 she wanted only the diamonds in the heart shape, so i removed the frame leaving the diamonds intact. the center heart was the only part to be repurposed from the original earring. as beautiful as the front was, i also was quite taken with the reverse side of the piece. the honeycomb shape allowed light to *delightfully* dance thru the diamonds, offering a boatload of dazzle. i wanted the backside to be as wearable as the front. the challenge was how to attach to a chain. 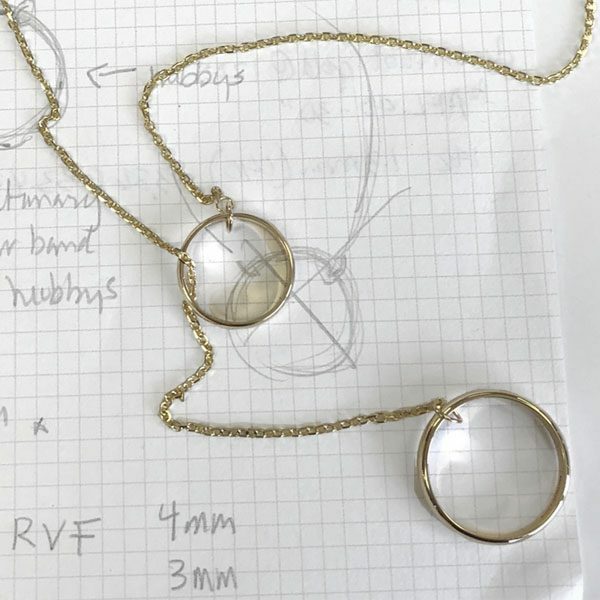 i was not sure if a bail (for a chain to feed through) would interfere with the overall reversible design. she provided a photo that demonstrated an idea she had envisioned. we used that as a guide, and the bow and pavé diamond bail were successfully incorporated with the heart. the finished piece is simply lovely and full of sparkle. she loves it! 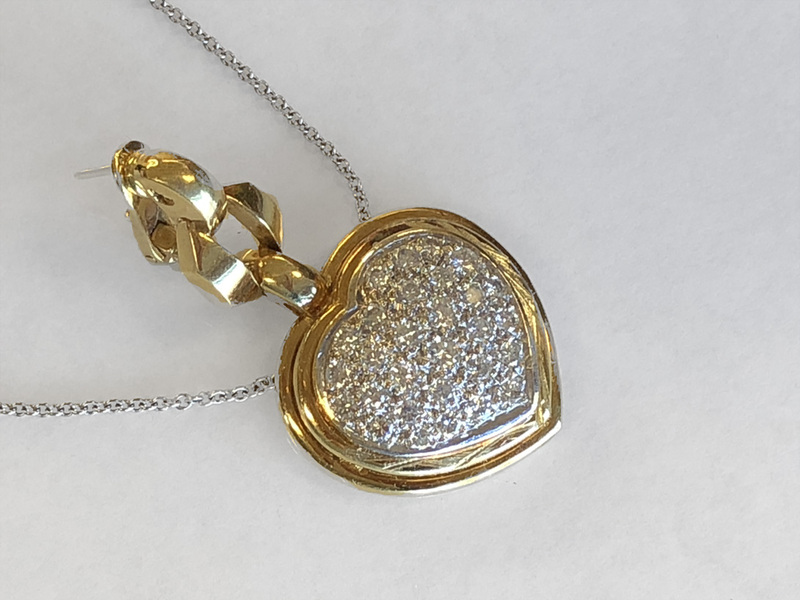 reversible diamond heart-shaped pendant in 18k yellow gold with a white rhodium plate. 14k white gold with a white rhodium plated bow & the pavé bail. all the pavé diamonds are full-cut. she donned new diamond heart pendant and walked out with a smile.